"Now, our struggle is for genuine equality, which means economic equality. For we know that it isn't enough to integrate lunch counters. What does it profit a man to be able to eat at an integrated lunch counter if he doesn't earn enough money to buy a hamburger and cup of coffee?" — Rev. Dr. Martin Luther King, Jr. Adult Education means so much to so many people, especially our immigrant and underprivileged populations. One of the most important priorities of Adult Education is to prepare students for living wage jobs. Nowhere is this more true than in the few remaining vocational schools in Los Angeles Unified School District's (LAUSD) Adult Education division. 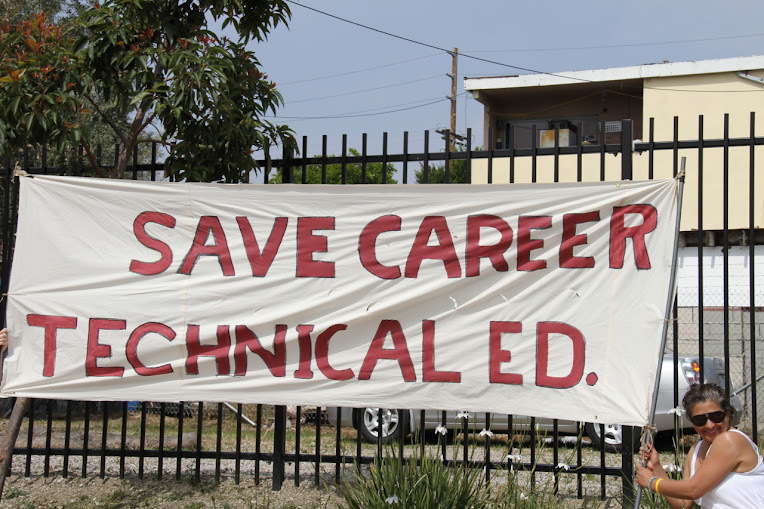 Recently LAUSD Superintendent Deasy and President Mónica García have once again expressed their willingness to axe an Adult Education program preparing community members for excellent, well paying jobs. On their chopping block this time is the North Valley Occupational Center's (NVOC) Aviation Center. Much like last year when the Deasy and García duo were all too eager to cut all the programs vital to our economic recovery, City Council Member Eric Garcetti has stepped up where the Superintendent and Board President have failed their constituents. Last year in his eloquent save Adult Education speech Garcetti spoke about saving "the core" to "grow the economy," and he drove home the point that we grow the economy through adult education. Such speeches, support, and City Council Resolutions set the backdrop for an amazing campaign waged by adult education students, teachers, and community members, who were able to save Adult Education from complete destruction. Thankfully Garcetti has stood up once again and is on the leading edge of the solution rather than the problem. Instead of accepting Deasy and García's logic that The NVOC-Aviation Center isn't as important as A-G Requirements or implementing more mind numbing standardized tests, Garcetti has been taking bold and innovative action to have the City significantly lower the rent to NVOC. He and the Council are working to get the Federal Aviation Administration to accept the deal. In other words, Councilman Garcetti is putting "students first" in practice. As a School Board Member I will work hand in hand with leaders who want to serve the community instead of the interests of corporate plutocrats, privateers, and the testing-industrial-complex. I admire Garcetti's willingness to take a principled stand that doesn't just benefit Adult Education students, but benefits our communities at large by creating living —and better— wage jobs. It's sad that the current LAUSD leadership has neither the foresight, nor the concern for the community to care about saving such critical programs. I commend Eric Garcetti and all the City Council Members who have stood up for LAUSD Adult Education. Real leadership doesn't reconstitute, close down, or privatize. Real leadership seeks local solutions that serve real people. Eric Garcetti is a candidate for the Mayor of Los Angeles. Robert D. Skeels is a candidate for the LAUSD Board of Education.